Figure 8.14 Leduc in 1947: its effects were, literally, explosive. In 1947, on the 13th of February, Leduc blew in. Let’s situate that in the context of mid-century Alberta. Following a period of promising growth before 1914 and in the 1920s, the provincial economy was devastated by the Depression of the 1930s and the environmental catastrophe of the dust bowl. Alberta was a poor and scruffy place. Paved roads were a rare sight. The major cities were barely more than large towns. Winters were cold and long, and to heat their homes and businesses, Albertans depended on wood (of which there was little in the Prairie region of the province) and coal, much of it mined in the murderously dangerous mines of the Crowsnest Pass. The Second World War charged up the local economy a bit, encouraging grain and livestock farmers as well as meat-packers in Calgary, but the return to peace raised fears of a return to economic stagnation. The Great War was, after all, followed by an influenza pandemic, industrial unrest, political instability, and an economic crisis in 1921. Albertans in 1947 could be optimistic only if they made a point of ignoring the recent past. Leduc changed everything. The first oil discovery in a field about 30 km south of Edmonton at long last vindicated a generation of geologists. According to one account, “Imperial Oil, which had drilled 133 dry holes and spent $20 million with little to show, finally had a major discovery.” Thereafter it was madness: “The spectacular Atlantic No.3 well, which came in as a gusher in March 1948, blew wild for six months, spilling over a million barrels of oil over the surrounding fields.”  The discovery at Leduc followed previous discoveries of naphtha gasoline at Turner Valley near Calgary, and even older coal mining resources, so Alberta already had something of an energy industry in place. However, this discovery was the start of something vastly larger, something that would alter the face of both Alberta and Canada as a whole. Figure 8.15 What used to be called “Turner Valley Skunk Juice” — naptha gasoline — is piped into drums, 1914. The oil boom of the post-war years rekindled old resentments toward Central Canada. Ottawa had enjoyed extensive control over the national economy during wartime, and the “Minister for Everything,” C.D. Howe, was still of a mind that he could accomplish whatever was in the interest of Canada as a whole, even in peacetime. That meant getting gas and oil from Alberta to factories in Ontario via a pipeline. For Albertans, this suggestion was worrying in the extreme. The carbon energy resources of the province were, they believed, the key to economic diversification. A province dependent on commodities like wheat and livestock would always be vulnerable to the booms and busts of the international market. Cheap fuel, however, could improve the quality of life and create new industries. In an age that lionized large-scale manufacturing, Alberta — and the West as a whole — still had precious little secondary production capacity. Albertans could look to Texas, another oil-rich jurisdiction, to see how its main cities had turned their wealth to good advantage. That vision would be realized in part, but not during the mid-century. What quickly became most evident was that Alberta was in the process of a socio-economic revolution. In 1921 the United Farmers of Alberta — a political party based on cooperative values, social gospel instincts, and the primacy of the agricultural sector — formed the provincial government in Edmonton. They were succeeded in 1935 by the Social Credit Party, an antimodernist, monetary reform movement/party with strong fundamentalist Christian values. These were political traditions that clearly had a religious component as well as an economic aspect. In a province that was mostly made up of homesteads and small towns, this made sense in that the local congregations were an expression of community and much of that community was doing the same thing: producing food. But Alberta was urbanizing slowly … and then oil sped up the process. Alberta tipped the scales to just slightly more urban than rural in 1951, 30 years after Canada as a whole. Fifteen years later, more than 7 in 10 Albertans were city folks. What’s more, the rural population was not just shrinking as a proportion: it was falling in real terms as well. In 1951 the high water mark for rural Albertans was reached at 488,733; it would bottom out at 458,870 (25%) in 1976. The rural share of population steadily fell from 61% in 1941 to 25% in 1976 and further to 17% in 2011. This reallocation of population took place against a background of profound growth. Between 1951 and 1961, the overall population grew by 40%, much of that expansion coming from natural increase. In 1941 there were just under 800,000 Albertans, and by 1971, that number had doubled to 1.63 million. There was, too, a renewal in the arrival of immigrants, many of whom headed to the expanding cities. The population of Calgary and Edmonton, both of which had languished for nearly two decades at around 80,000 residents, doubled in the 1950s, and pushed past the half-million mark in the late 1970s. In 1941 their populations were at the bottom rungs of the top 10 largest Canadian cities, but in 1961, Edmonton was the fourth largest and the third largest in 1971, eking out Vancouver (not including its suburbs). During the same period, Calgary moved into fourth place and was 33% larger than Ottawa. This explosive demographic growth was spurred by economic expansion, most of which occurred in the oil patch. Production more than tripled between 1960 and 1973. Ancillary industries associated with finance opened branch offices in Albertan cities. Calgary in particular emerged by the 1980s as a centre of the insurance industry. Economic diversification, however, remained elusive. The aging Social Credit regime faltered with the retirement of long-time Premier Ernest Manning (1908-1996) in 1968, and a new, more aggressively pro-development Conservative government came to power in 1971 under Peter Lougheed (1928-2012). Fifty years had passed since Albertans had elected one of the two mainstream parties to the legislature in Edmonton, and criticizing Ottawa for provincial woes had become an institutionalized pastime. The Lougheed administration continued that tradition while breaking sharply with the rural-oriented economic visions of the past, applying a stronger planning model, and building on the Social Credit government’s investment in education and training. Their timing was perfect. Global oil prices were remarkably flat from the 1920s to the 1970s. Whether measured in real dollars (based on 2008 values) or unadjusted prices, there had not been much fluctuation, notwithstanding a bit of a trough in the 1930s. This stability was achieved by the collaboration between the “Seven Sisters” — the largest international oil companies — and an economy-wide lack of price inflation. By 1970, however, American crude production was falling, and Washington’s involvement in the 1973 Yom Kippur War in the Middle East spurred a dramatic and overnight response from the Organization of Petroleum Exporting Countries (OPEC). In October 1973 OPEC raised the price of oil by 70%, imposed an embargo on sales to the United States, and cut output. What came to be called the “first OPEC oil shock” combined with instability in global finances (caused by the collapse of the post-WWII Bretton Woods system of currency alignments), which led to widespread price inflation, rising unemployment, industrial failures, and the beginning of an economic recession. In addition, some oil/petroleum rationing occurred in North America. These features of the oil crisis were felt across the Western world (targeted by the Arab-dominated OPEC nations) and were compounded by a sagging Canadian dollar, which impacted Canadian manufacturers’ exports. These events set the stage for rising economic and political tensions in Canada. Alberta, which to this point had profited modestly on oil sales, suddenly became enormously wealthy. Its political and economic elites — described at the time as “blue-eyed Arabs” — took the centre stage of national affairs and were increasingly confrontational when it came to Ottawa’s involvement with the energy sector. The constitutional context of the oil industry was important in these debates. Provinces control their natural resources but only until they reach a borderline. Movement of oil or natural gas through pipelines into another province — let alone exports into the United States — brought Ottawa into the equation. 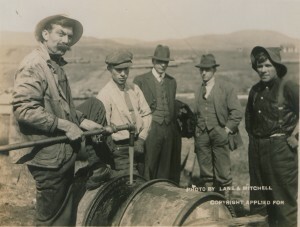 The Social Credit governments had done much to ensure provincial oversight when it came to internal pipelines so as to limit Ottawa’s influence. Demand from Central Canada’s growing metropolises and factories guaranteed sales whenever American markets cooled, but it also ensured the involvement of the Ontario and Quebec dominated administrations in Ottawa. In the late 1950s, both gas and oil/petroleum were being piped to Central and Eastern Canada, where they had to compete with the oil being imported from the Middle East and elsewhere. In 1961, the federal government drew the “Borden Line” along the Ottawa River to create two oil markets in Canada, and oil in the market west of the Borden Line was as much as a third more expensive. This changed in 1973: first due to a new export tariff (introduced under Pierre Trudeau’s administration) and second with the OPEC oil shock. By this stage, Saskatchewan had joined the ranks of natural gas and oil producing provinces, which already included British Columbia and Alberta. (Moreover, BC had had its own run-in with Ottawa over energy policies when its government negotiated the Columbia River Treaty over hydroelectricity exports with the United States in the early 1960s.) The possibility of a regional protest against federal energy interventions was greater in the 1970s than in any previous decade, and the stakes were vastly higher. Ottawa took the view that Alberta was enjoying “windfall” profits, which rightly belonged to all Canadians, although Albertans felt differently. They disagreed with the National Energy Board’s assessment that oil supplies were limited in the extreme and should thus be preserved for domestic use and treated as a special commodity (with echoes of wartime control over key supplies). Albertans were determined to use oil as part of a strategy to diversify the provincial economy so that when the OPEC-produced windfall inevitably ended, Alberta would have a resilient economic order in place. Ottawa developed several strategies. The first was to ensure energy security for Canada by slapping an export tax on shipments destined for south of the border. Even during the apparent oil shortage of the 1973 OPEC oil shock, this tax reduced Alberta’s oil profits. Lougheed responded with an increase on royalty charges on publicly-owned (Crown) resources. Oil companies had grown accustomed to writing off royalties in their federal corporate taxes, and they hoped to weather this increase in provincial taxes by continuing to do so; however, Ottawa closed that tax loophole. It took the rest of the decade to disentangle the bad feelings and confusion over pricing and revenues. If tariffs and royalties were inadequate to the task of establishing national oil security, there were other options to pursue. The foremost of these came into play in 1975 when the federal government launched a nationally-owned oil company called Petro-Canada (aka Petrocan). In part this was a result of the Liberals having lost their majority in the House and being dependent on an NDP balance of power (which was highly pro-Petrocan). Treated with suspicion by Alberta, the new corporation was challenged to acquire high quality properties, processing capacity, and oil reserves. Despite all of this, tempers cooled as the decade came to a close. However, matters took a turn for the worse in 1979. The second OPEC oil shock (1979-1980) saw a return to sniping between Ottawa and Edmonton. The return of the Trudeau government (restored after a 9-month Conservative administration under Joe Clark) was quickly followed by the introduction of the National Energy Program (or NEP). By this time, the price of crude oil had leapt from the pre-1973 price of $3 to nearly $40 a barrel. The NEP addressed purported shortages by guaranteeing national energy self-sufficiency, taxing the fuel resource to benefit Canadians outside of Alberta, and extending still further Canadian ownership of the oil sector through the instrument of Petrocan. The whole package was based on predictions that oil prices would continue to rise over the next decade. In fact, they reversed, falling to $10 a barrel. Ottawa was left carrying the cost of subsidies to oil-consuming industries with none of the revenue-stream that had been anticipated. Federal deficits grew and the government’s popularity shrank. Opposition in Alberta was ferocious: the mayor of Calgary, Ralph Klein, advocated turning off the pipelines and snarled, “Let the Eastern bastards freeze in the dark!” — a sentiment that afterwards appeared on bumper stickers across the West. The NEP stirred up a hornets’ nest of constitutional disputes, did little to support energy self-sufficiency, plunged Ottawa into debt, and undermined the principle of equalization payments. It did, however, raise the question of whether there might be a Canadian “national interest” and determined the extent to which regional disparities in wealth and opportunities should be suffered or ameliorated. The existence of oil-saturated sands along the banks of the Athabasca River had been known about for centuries. The tarry substance was used by First Nations to seal the hulls of their canoes long before the arrival of European traders. Commercial exploitation of the oil sands was, however, extremely limited until the 1970s. Its first commercial use was as a kind of asphalt road surface mined straight out of the ground. By the 1960s there were several methods available to extract the oil from the sand, but they were prohibitively expensive. The oil shocks of the 1970s changed that equation. Following the first OPEC crisis, various companies were in a position to begin a commercial scale separation of oil and sand. At the forefront of these companies was Syncrude, which began production in 1978. The downturn in global oil prices after 1981 reduced interest in the oil sands, but improved processes, and the rising oil prices enabled Syncrude to increase production to 90 million barrels per year in 2001. An insatiable demand for skilled and semi-skilled labour turned the neighbouring town of Fort McMurray into one of the country’s fastest growing communities in the 1970s and 1980s. In 1961 there were fewer than 2,000 people in the village, and by 1971 6,800; this latter number more than doubled in the next 5 years, and then doubled again to 31,000 in 1981. It is currently reckoned to have a population of 77,000 — at least one-fifth of which is non-permanent. Criticism of the environmental implications of oil sands extraction, and the subsequent transportation of bitumen, may have taken some of the shine off of the oil sands industry, but it has significantly extended the prosperity of Alberta. Historian Sean Kheraj (York University) investigates the history of pipeline failures and Canadians’ connection with their energy sources. The two oil crises of the 1970s had several important consequences. First, they pitched Alberta into the spotlight of national events and made a national figure of Peter Lougheed — an articulate and thoughtful politician. Second, they created significant tensions within Canadian federalism, increasing demands for decentralized authority or, what was called at the time, centrifugal federalism. These crises also undermined the federal formula for “have” and “have-not” provinces that was based on provincial per capita incomes and assumed that wealthy provinces would necessarily have large populations (not the case, relatively speaking, in Alberta). National equity programs were suddenly in jeopardy, which was felt sharply in the Maritimes. For most Canadians, what mattered was how the oil crises changed their daily lives. Inflation — almost unheard of since the 1920s — was back with a vengeance. The cost of shipping food products grew dramatically, as did household food expenditures. For the first time since 1945, Canadians were experiencing, on a very broad scale, a fall in their average standard of living. There were technological and environmental consequences as well. Gas-guzzling North American automobiles were being challenged by smaller, lighter Japanese imports. A whole new sector of the Canadian auto-industry would eventually emerge, along with the development of redesigned North American vehicle engines. Efforts to reduce gas consumption, and thus operating costs, was complemented by attempts to diversify energy sources. Experiments involving nuclear, solar, and wind energy accelerated in these years, although to little effect. The global context of the oil crises would be felt by Canadians for years. OPEC was regarded by governments in Washington as mostly antithetical to America’s “national strategic interests” (oil) in the Middle East. What began as a protest against American and European involvement in the Yom Kippur War — a chapter in the Cold War in which the USSR was supporting Egypt — catalyzed anti-Western feeling. The toppling of the Shah of Iran in 1979 (which precipitated the second oil shock) had consequences for regional affairs that would percolate into the 1990s and the 21st century, drawing Canada into wars and interventions in Kuwait, Iraq, and Libya (see Sections 9.12 and 12.2). Figure 8.16 Alberta Premier Peter Lougheed (centre) and Quebec Premier René Lévesque had a common foe in Ottawa. 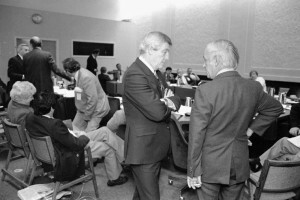 At a 1981 meeting of premiers. Finally, the rise of Alberta in the 1970s — complemented by a strong British Columbian economy and the growth of the natural gas, potash, and uranium sectors in Saskatchewan — tipped the balance of power in Ottawa. The election of Calgary Conservative, Joe Clark, as PM in 1979 was one indication, however brief, that the tide was turning. The much more successful government of Brian Mulroney, from 1984 to 1993, depended heavily on western alienation for its success. In addition, the appearance of Western separatist sentiment and the Reform Party led by Preston Manning (son of the former Albertan Premier) had deep roots in the events of the 1970s. Reform would go on to transform the “Progressive Conservative” party into the “Conservative Party” led by Stephen Harper, another Calgarian (see Section 12.3). Ironically, Alberta became much more Canadian through this process: the oil patch created jobs that attracted Canadians from every province. Indeed, Mr. Harper (born and raised in Toronto) moved as a young man to Edmonton to take up a low-level office job at Imperial Oil before moving on to the University of Calgary to study economics. 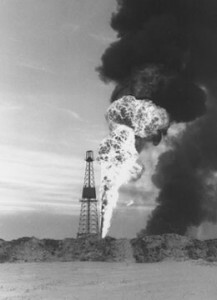 The oil economy in Alberta took off in the 1940s and 1950s, and accelerated with the first OPEC oil shock in the early 1970s. Some of the effects of the oil boom included a dramatic shift from rural to urban life, and a rapid increase in population in Calgary and Edmonton in particular. Federal attempts to capture some of the windfall profits of the oil shocks in the 1970s provoked strident anti-Ottawa feeling in the West. Rising oil prices brought within reach the development of the oil sands, extending for decades Alberta’s oil-based prosperity. The oil crises of the 1970s and 1980s had international repercussions, but most Canadians felt it in their wallets, since inflation reduced household incomes significantly and rapidly. Leduc oil by Spanwar is used under a CC-BY-SA 2.0 license. Peter Lougheed and René Lévesque (Online MIKAN no.3575754) by Robert Cooper / Library and Archives Canada is in the public domain. 8.10 Oil and Gas and the New West by John Douglas Belshaw is licensed under a Creative Commons Attribution 4.0 International License, except where otherwise noted.